There is nothing Aussies love more than a punt, and there is certainly no shortage of options in the NT, with a variety of live sports and racing facilities, plus your traditional clubs offering pokies and Keno services, while there is also the option of heading out to the state’s premium gambling venue – the SkyCity Darwin Casino. Darwin is the capital city of the Northern Territory and is the smallest and most northerly of the Australian capital cities. Located on the Timor Sea, the area is renowned for its rugged natural beauty, with an abundance of national parks, tropical weather and coastal areas featuring extensive beaches. Being a relatively small city, Darwin has a laid-back atmosphere and in typical Aussie fashion, it’s visitors and population of just 136,245 enjoy frequenting local pubs and clubs, many of which are licensed gaming facilities, which we detail and list below. The largest gambling venue in the Northern Territory is the SkyCity Darwin Casino – the ultimate entertainment destination. The Casino features over 700 electronic gaming machines, more than 30 table games, five gourmet restaurants and seven bars. 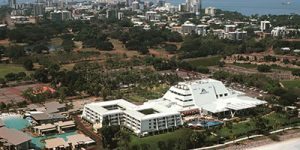 Nestled on 30 acres of tropical gardens, SkyCity is Darwin’s only five-star beachfront resort boasting 154 rooms, a number of VIP Super Villas featuring their own gaming suites and a luxurious day spa. It is the ultimate nightlife destination in Darwin as well as being one of the hottest tourist attractions. For those gaming enthusiasts, the SkyCity Casino is open 24 hours a day, seven days a week, with the gaming machines operating at all hours. The non-stop gaming means you can come out to play anytime you want, with the casino’s two-level gaming facility catering to players of all levels, ranging from your most basic slot machines through to action packed bonus video slots. Some of their premier products include Reels of Wheels, Vegas Star and Goliath, while members and VIP guests can take advantage of the Diamond room and Sky room respectively, both of which offer unique and exclusive machines such as Dynamite Cash, Lucky Strike and Tunes of Fun. If you want to take a break from the pokies, SkyCity Darwin also has a wide range of table games on offer throughout the betting floor. Baccarat, Blackjack, Caribbean Stud, Roulette, Rapid Roulette and Money Wheel are all popular picks for those who enjoy the thrill of these games more so than pushing a button on a slots machine. While the gaming machines never take a break, table games on the main gaming floor are open from midday, seven days a week. The main gaming floor closes at 4am Thursday to Sunday and 6am on Friday and Saturday. It’s not all about the glitz and glam of a big casino, with many punters in Darwin preferring the more laid-back betting experience offered at their local pub or club. What happens when you are in Darwin and feel like having a flutter on the pokies, but it is the middle of summer and stinking hot – so you don’t want to move from in front of your a/c? Or what happens if you are in a more remote part of the Northern Territory and don’t have the luxury of heading into town whenever you feel like it for a crack at the riches at SkyCity Casino? Luckily, there are now plenty of online casino options for punters wanting to experience the thrills of winning big at a casino in the comfort of their own homes. Don’t be alarmed – these casinos are perfectly safe – with all of our recommended sites meeting the highest security standards to ensure your personal details and banking information is secure at all times. Our recommended online casinos offer free play, while there is also the option to play your favourite pokies or table games for real money anywhere, anytime on your computer, mobile phone or tablet. Mucho Vegas – This is our top rated casino for our online readers from both Australian and New Zealand. Offering a dynamic, real money experience, Mucho Vegas is the one-stop casino for all your gaming fancies, with top games from the leading market providers such as Betsoft, iSoftBet and Pragmatic Play. Slots Million – This is the best online pokies casino available for Australians. Slots Million features over 900 Aussie-friendly pokies games with a variety of different themes and by several leading and niche gaming developers who make everything from classic pub fruity games to 3D-animated cinematic poker machine experiences.